I need 1100 cps. havok, spiral, rescue, valkryie, bishop and vision. yeah.... how to defeat the heroic boss with 100000 score and the hood with 85000 score? For Task 21b use Hercules and Ares and be sure to kill any enemy with counter attack. Task 12b still trying. My best score was 72k. guys, just 2 tasks ahead..but not able to get 100k & 85k... suggestions plz.. sombody please.. Try with Heimdall for Ape-Man. Use the horn + some buffs, then, Coulmn down or Uru sword to kill three enemies at a time with massacre. I made kind of 110. To Hood... Im trying with Havok, but i got 77, still trying. I'm tempted to use de 20 gold to skip. Ok, can someone help me out here? I have 2 tasks left for this chapter, how do I get 85000 for beating The Hood and how do I get 100000 for beating the Man-Ape?? I mean come one, I saved the mini boss for The Hood, the most I got was 72000, & like 80000 for beating the Man-Ape but still how is it all done??? What do I have to do? They ask now just 70 000 for Hood. 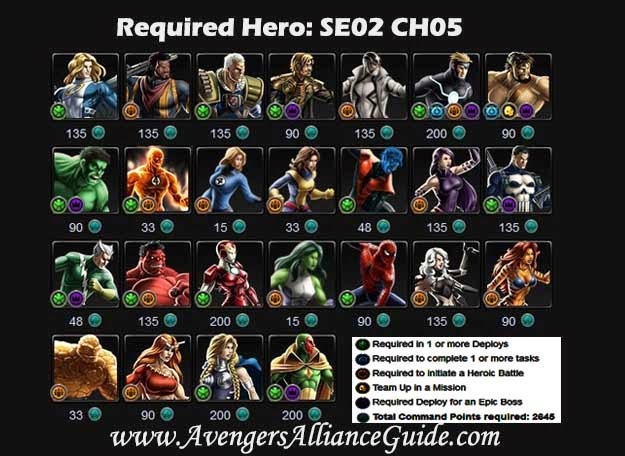 Try Havok, and use agent and Squirrel just to heal and enforce Havok attacks; be patient with losing turns, and use his second ability with a lot of buffs; beat all enemies with one shot+massacre. I failed with Bullseye, and also got 82000, beating Hood with one shot and epic massacre. I still need 535 command points to complete this chapter. I have a long way to go.